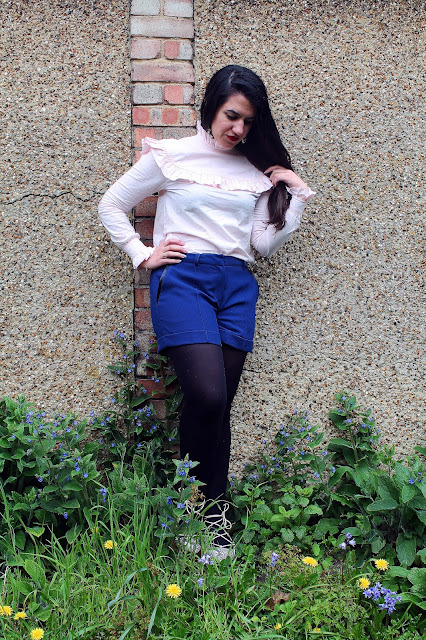 This has been one of the hardest posts to edit as of late – my friend took lots of photos, we tried lots of different backgrounds, it was a very in-your-face blouse. 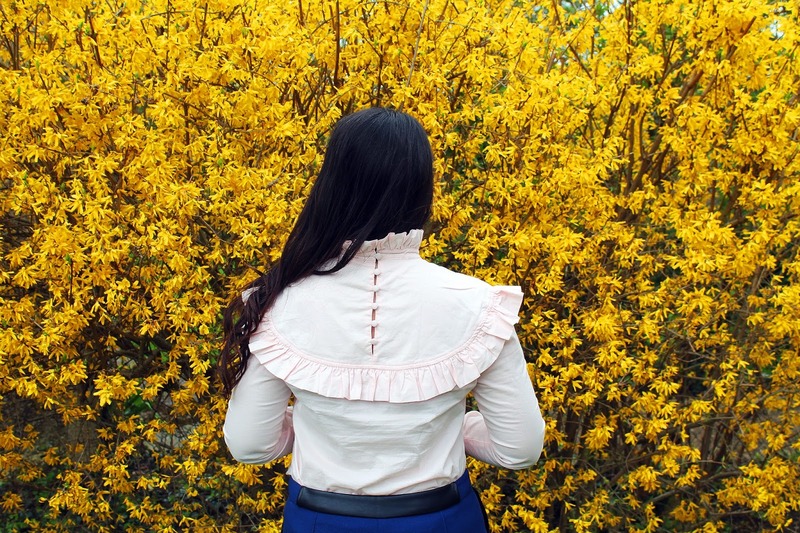 But let’s face it – when one wears such a unique blouse, it’s not going to be the easiest task. 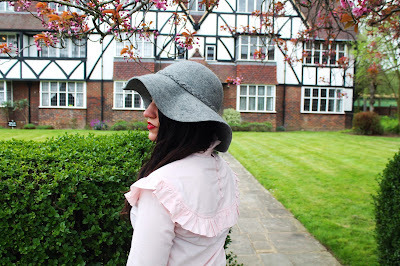 When I heard that Alexa Chung would be doing a collaboration with Marks & Spencer, a sense of anticipation kicked in – what I mean by that is that I totes signed up to M&S’s mailing list to find out as much as possible about Archive By Alexa. For any of you peeps who haven’t heard about this (I won’t judge – much) let me explain what the fuss is all about. A few months ago model/TV presenter/Vogue contributing editor/reluctant It-girl/style icon Alexa Chung was invited to discover British brand Marks & Spencer’s archives – to then pick out, reinterpret and redesign a selection of items. These pieces make Archive By Alexa, a very pretty, very Alexa, womenswear collection that came out on the 13th of April. 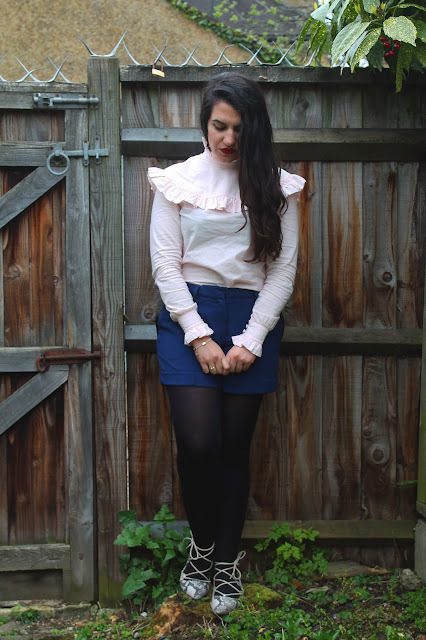 Blouse, Archive By Alexa at M&S (available here). 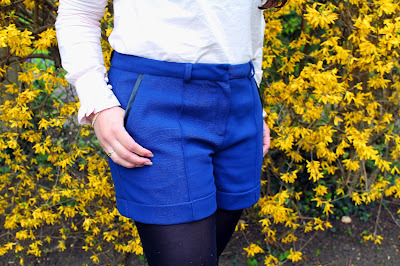 Shorts, Lavand. Shoes and hat (seen below), Primark. Earrings, Pink Lovebird. Bracelets and ring, gifts. Coat, French Connection (seen below). Bag, The Cambridge Satchel Company (seen below). As soon as the first images started showing up, it was a case of love at first sight with this blouse, the Harry blouse. The frills! The colour! The drama of it all! I was in love, I had to have it. Negative me thought it would sell out, but I was delighted to see that, when frantically going on M&S’s website after getting the email that Archive By Alexa had gone live, all sizes were still available. No, this would not be a Kylie Cosmetics or whatever designer for H&M situation, I could peacefully add the Harry blouse to my basket without having a heart attack. My friend and I went to the store launch on the 13th of April – and silly me got a little starstruck when spotting Alexa Chung wearing the super cute Elsie dress. There was a queue for those who wanted to get a picture taken with her. Nah, I didn’t need a pic with her. But then, I kind of really did want a picture with her. This is one of the few celebrities whose style I genuinely have a soft spot for. I tend to buy magazines that feature her (because there’s something about having Alexa in an editorial that just makes the editorial so much better) and yes, I gave in and bought her book “It.” I finally admitted to myself that I’m not the least bit cool and totes wanted to act like a super giddy fan – but it was too late. Just as we approached the end of the queue, security closed it off. 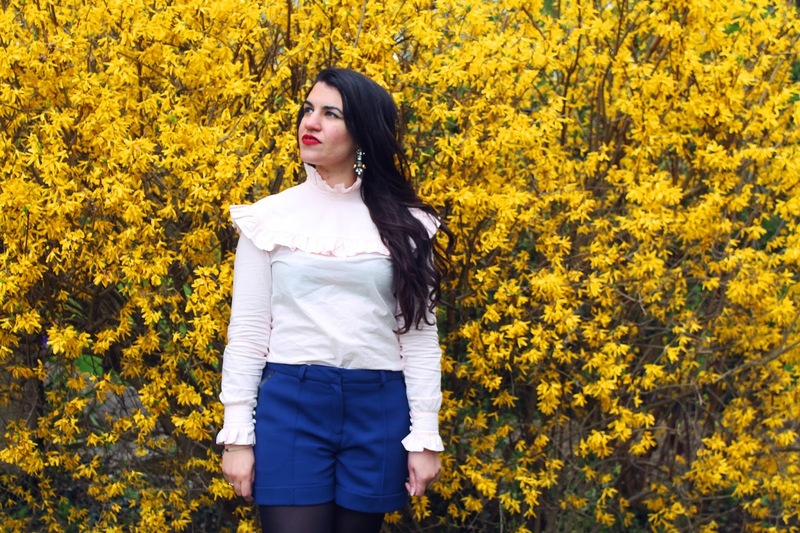 I’ve got to be honest though – this blouse is a b*tch to take on and especially off. Damn, Victorian women had it hard! I mean, those buttons are intense – but at least they look pretty beautiful. 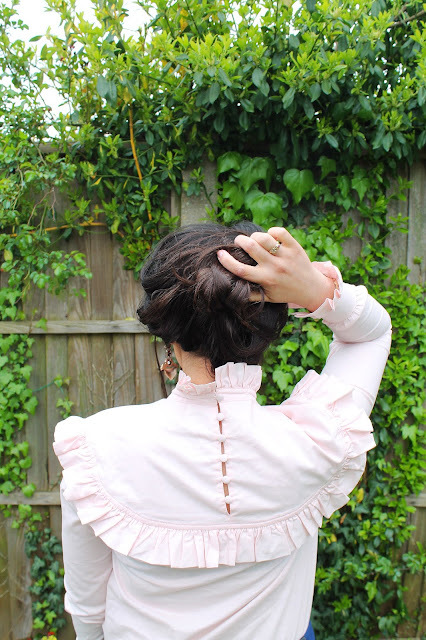 Speaking of Victorian style, that was what I loved so much about this blouse – it doesn’t really feel like a reinterpretation, it feels like a total replica of what would have been worn back then. I love, love, love how the frills go around the shoulders, I love the neckline, I love the cuffs. 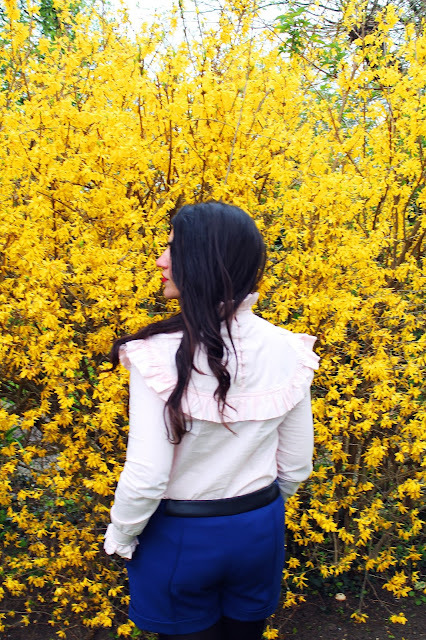 I’m sorry to not say anything more original but I feel this like blouse is so in your face that you either love it or loathe it. It’s just not an in between top, why would it cause in between opinions? 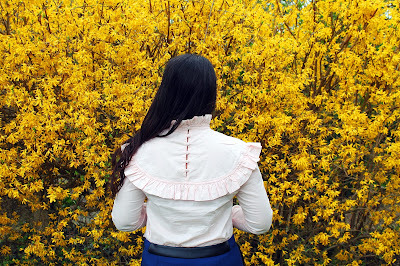 Its OTT vibe reminds me of Francis Ford Coppola’s ridiculously stylish and gothic 1990 film “Dracula.” I also love the fact that this blouse was originally conceived in the eighties, when the Victoriana trend was thriving. Yes, the decade that taste forgot and that everyone loves to hate. I love the eighties! 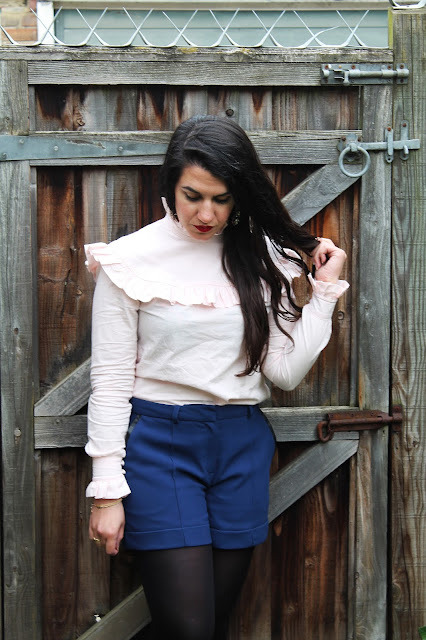 A dramatic, vintage-esque blouse calls for dramatic earrings. I chose this fancy pair that I got last month from Canadian online jewellery boutique Pink Lovebird. 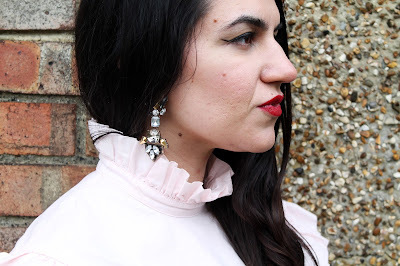 I have fallen in love with big earrings all over again, so expect to see lots more coming up on the blog. 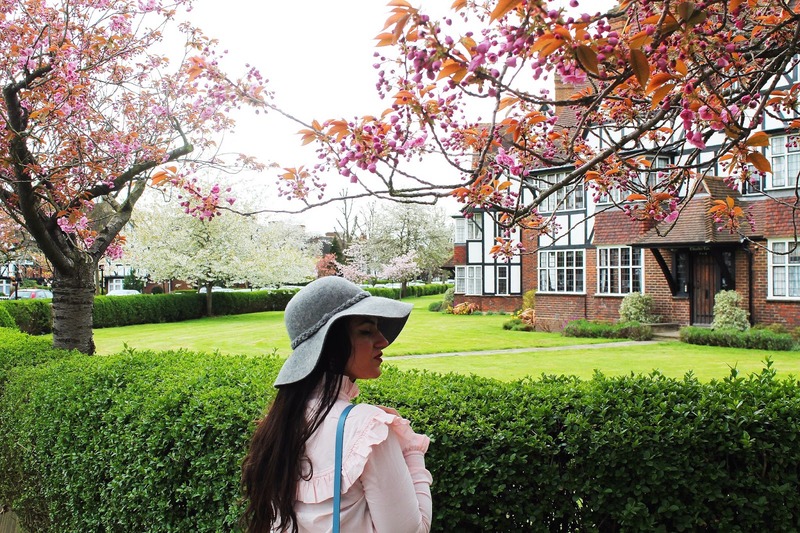 And yes, we stuck my new bag from The Cambridge Satchel Bag into a bush solely for aesthetic purposes. Scallop edges still drive me nuts so when TCS brought out a whole scalloped edge collection I was instantly obsessed. 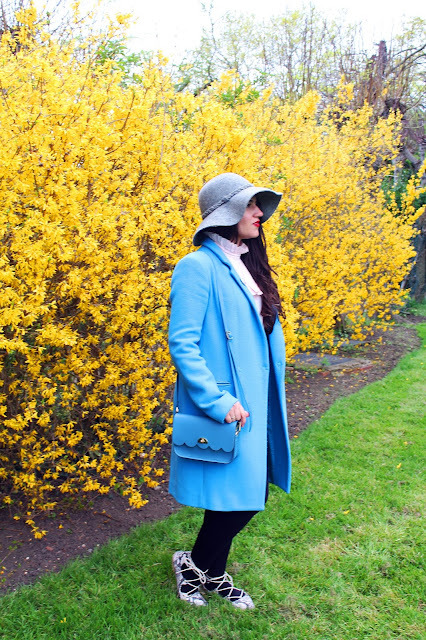 I got this baby at the brand’s sample sale last month, together with my pink satchel (seen here). At first I wasn’t sure about the colour – I’m more of a pink & pastels kind of gal – but I’m thrilled that I got it, I’ve surprisingly been using it loads. Slate blue – who would have known? To add even more drama to the look, I added lace-ups. A few weeks ago I became obsessed with lace-ups – it literally happened from one minute to another. And I’m obsessed with this snakeskin pair from Primark, which is a shame because my love for them will probably last longer than they will! 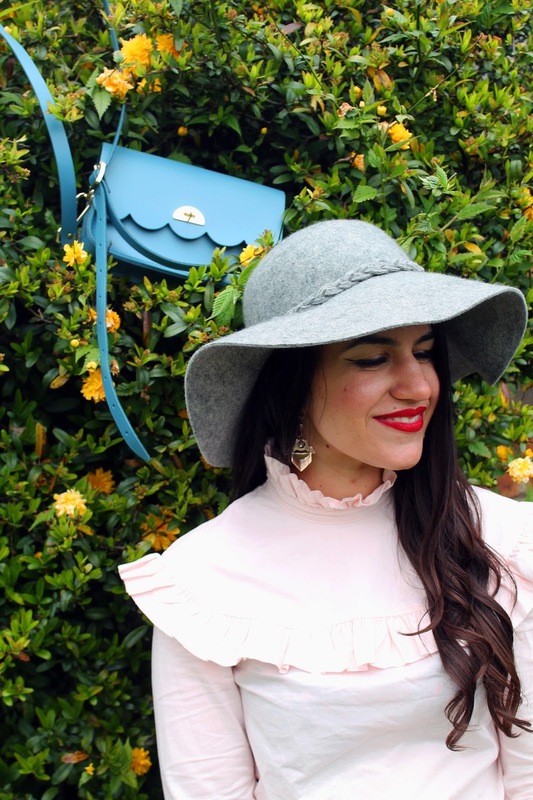 But it’s all about enjoying the present – and the past few weeks they have added the perfect touch of pizzaz to my fashion life. 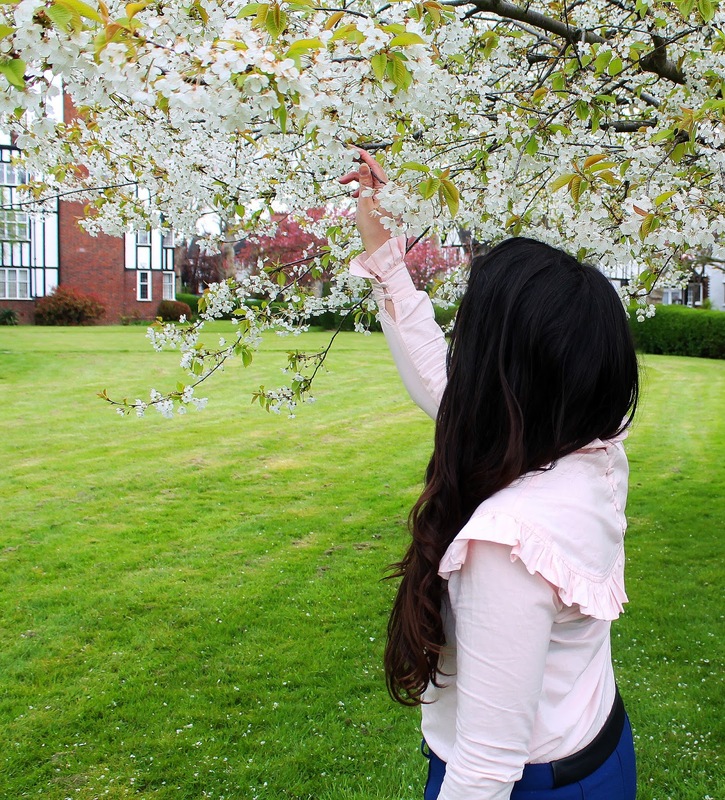 Spring played in an important role in these pictures! 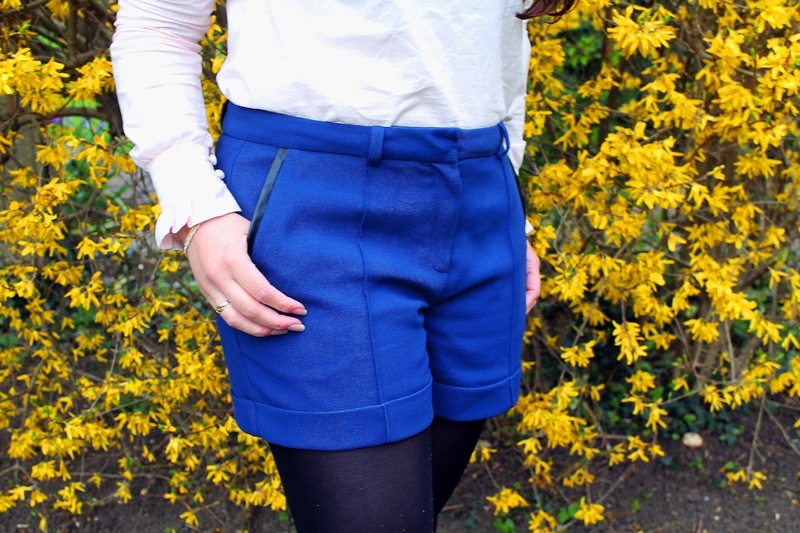 Finally, the shorts – they are from the Spanish brand Lavand. 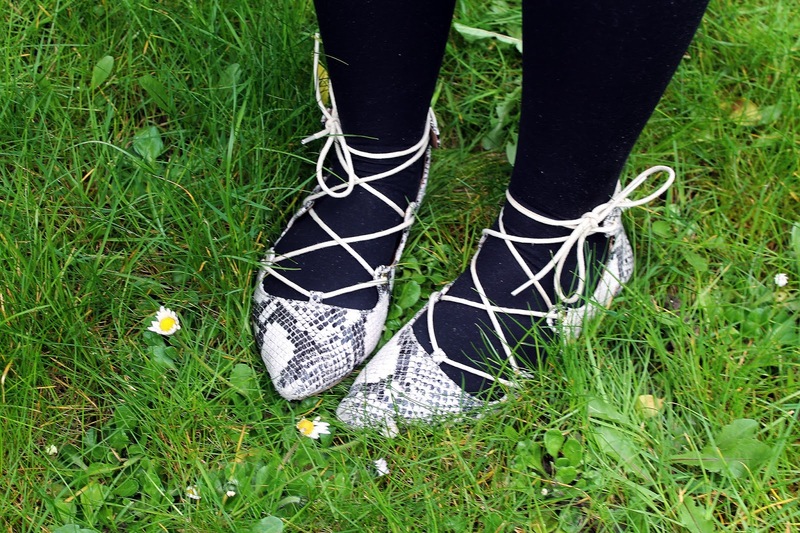 These babies are a sample I bought at my work place only a few weeks ago and even though they are from their A/W’16 collection, I have a feeling they are going to be one of my key pieces this summer! So that’s the whole outfit – a little quirky, OTT… I felt so happy wearing it. 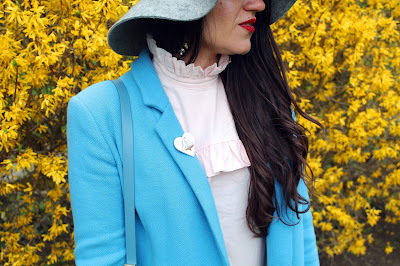 I struggled when choosing a coat for this outfit – in the end, my French Connection coat (which I may not have had for long but pretty much feels like a wardrobe classic) felt like the right kind of contrast. 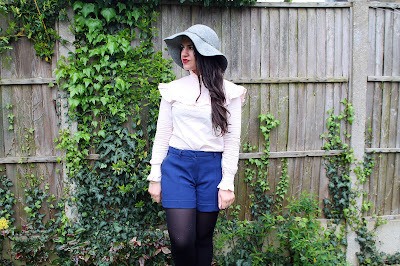 And this is me honouring/copying one of Alexa’s pretty poses for M&S’s campaign. Both the brand and Alexa (who is, and I mean this in a good way, her own brand) are so quintessentially British and easily relatable. M&S have found that good balance between being fashionable and practical, and Alexa Chung, one of the most influential style icons ever, has a natural charm about her, which makes her style appealing and achievable. So surely it makes for a great match? You did good, M&S. Are any of you peeps an Alexa Chung fan? Is there anything you would buy from the collection? I’m delighted with this piece so don’t really have eyes for much else, although I’ve seen lots of bloggers wear the Eliza dress, which is a total cutie. 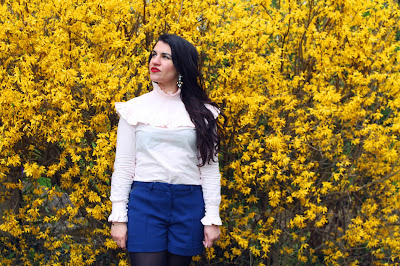 I’m also so happy I have managed one more #ootd post for April, as I don’t feel like I ever blog enough during April! 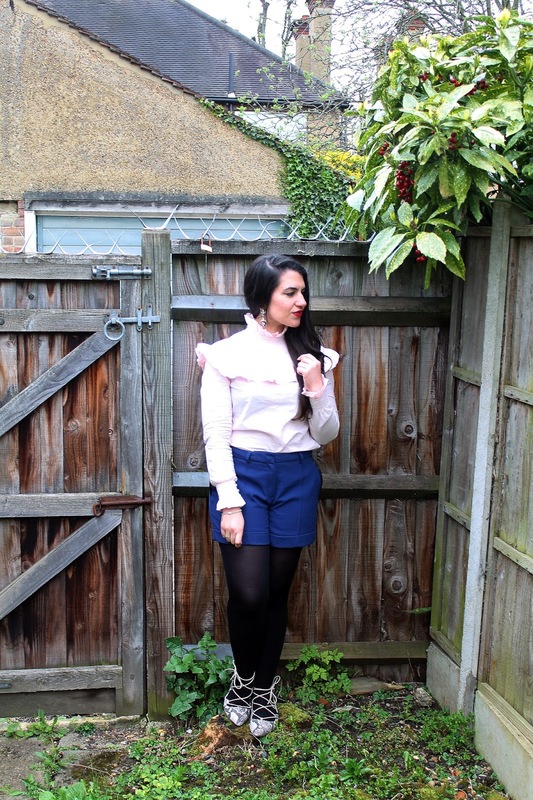 Plus, these pictures were taken just yesterday – that is me being on it for a change. I’m not too sure when my next post shall be as I’ve got a big holiday coming up, but you can always find me on Instagram! Until then – toodle-oo! Photographed in West Acton, London, on April 24th, 2016 – pictures taken by Diana.